Sorry... the 2017 Jeep Renegade is no longer being sold as new. 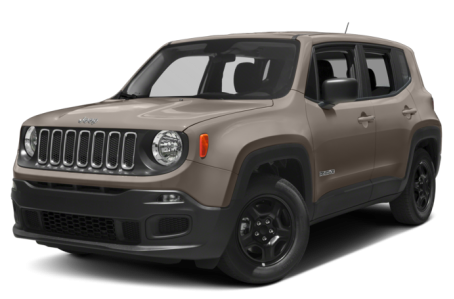 Instead, take the first step to a great deal on 2019 Jeep Renegade with a free price quote! The 2017 Jeep Renegade is a subcompact SUV that seats five passengers. It competes with the Mazda CX-3, MINI Countryman, and Chevrolet Trax. This year, it remains largely unchanged. Four trims are available: the Sport, Latitude, Trailhawk, and Limited. The Renegade is Jeep’s smallest SUV. Overall, it has a blockish, muscular appearance with a black-clad, lower underbody. The front-end features Jeep’s seven-slot grille flanked by circular headlights and a sporty, yet rugged-looking lower fascia. At the rear, squared taillights with a unique ‘X’ motif are house in a black frame. Standard features include rain-sensing wipers and 16-inch wheels. 17- or 18-inch wheels are also available. The Renegade is powered by a standard 160-hp, turbocharged 1.4-liter 4-cylinder engine mated to a 6-speed manual transmission. A more powerful 180-hp 2.4-liter 4-cylinder mated to a 9-speed automatic is available as well. Front-wheel drive is standard, while four-wheel drive (4WD) is optional. The Trailhawk trim has its own 4WD system with a rock-crawl mode and hill-descent control. Fuel economy for the Turbo 1.4-liter Renegade is an EPA-estimated 24/31 mpg city/highway. It lowers slightly to a 22/31 mpg for the 2.4-liter/FWD Renegade and 21/29 mpg for the 2.4-liter/4WD model. Inside, the Renegade has a standard cloth interior with a 60/40-split folding rear seat. Behind the rear seats, cargo capacity is 18.5 cubic feet. The center stack comes with a standard audio system with a USB port. Two more advanced multimedia systems are available: one with a 5-inch touchscreen and another with a 6.5-inch touchscreen. The Uconnect 5.0 system has Bluetooth connectivity and satellite radio, while the Uconnect 6.5 comes with navigation, HD radio, and voice command recognition. Standard features include air conditioning, a tilt/telescoping steering wheel, and power windows/locks. Dual-zone automatic climate control, automatic dimming rearview mirror, keyless push-button start, a 115-volt plug, a BeatsAudio system, and a 40/20/40-split folding rear seat with a trunk pass-through are available as well. Standard safety features include seven airbags, antilock brakes, and electronic stability control. There is also plenty of available safety technology including forward collision warnings, lane departure warnings, blind spot warnings, and a rearview camera. 139 of 140 (99%) consumers said they would recommend this vehicle to a friend.